Amazing twirlers, great friends off the field and amazing academic dreams - meet Ashley Burkin and Nicole Harris from Michigan State University and learn why they have become such great role models for young twirlers! If you're interested in being featured for #TwirlerTuesday, email our team at CMBTwirl@Sullivation.com. CMB: Introduce yourselves and where you are from! Ashley: My name is Ashley Burkin and I am from Mentor, Ohio. I am majoring in Chemical Engineering and am a member of the Honors College at Michigan State University. I am a student of Audrey Moore, the director of the Showstoppers School of Baton in Wickliffe, Ohio. Nicole: My name is Nicole Harris and I’m from Wixom, Michigan. 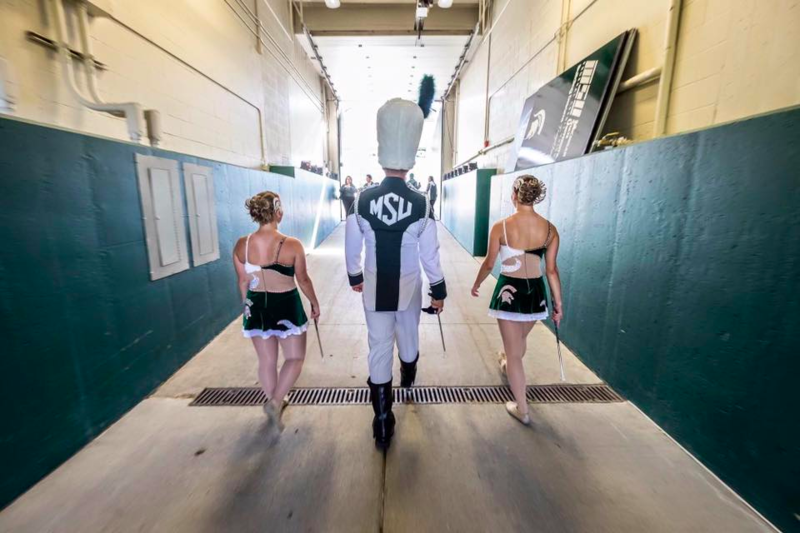 I am a student at Michigan State University where I have the honor of being one of two feature twirlers with the Spartan Marching Band. I have been twirling baton since I was 5 years old and am a proud member of the Twirl-M’s baton twirling team under the direction of Rhonda Muscaro. CMB: Favorite memory being a part of your college marching band? Ashley: There are so many memories that I can choose from. I have been fortunate enough to attend two Big Ten Championship games, a Rose bowl, a Cotton bowl, and a 2nd Cotton bowl for the 2nd College Football Playoff in addition to 7 home games each season. My favorite memory would have to be from my first Big Ten Championship in 2013. Nothing will ever come close to the overwhelming feeling of family I felt when we realized the Spartans were attending the Rose Bowl for the first time in 25 years. More specifically, our drum major at the time, Frank, gave me one of the biggest bear hugs and twirled me around in celebration. That’s what makes the Spartan Marching Band so special. We’re one big family that prides ourselves in protecting one another. Nicole: One time at band camp I was convinced that I had to march while carrying a Tuba. It was my freshman year band camp and I went to lunch with Ashley and several of the Big Ten Flags. We were talking about my freshman dress coming up, which is completed by every member during their first year in the band and is the final step in becoming a full fledged member of the SMB. They convinced me that part of the way through freshman dress we switched instruments with other members, and that I might have to complete series while carrying a tuba. If you have ever seen our series, you will understand how terrifying that thought is. This is how my nickname “Gullibear” came about. Nicole: My most favorite accomplishment was being chosen in 2014 as one of the US Twirling Ambassadors to Peru. I not only was able to do what I love in another country, but I got to spend two weeks really getting to know some of the girls I had spent my entire twirling career competing with. As any baton twirler knows, the only way to achieve your twirling goals is to practice hard each and every day and commit to doing everything you can to becoming better than you were the day before. In addition, I have been extremely blessed to have some of the toughest and most caring coaches who not only taught me everything I know about twirling, but who also taught me how to persevere and never give up on my dreams, no matter how far fetched they may seem. Nicole: Honestly, I would just hope that when they are looking for a college they remember that although twirling may seem like the most important part of life, there are so many aspects to life that are affected by your college decision. I remember back to my mom saying that when I pick a school I shouldn’t only think about the twirling opportunities, but that I should also think about my education and whether or not the university felt like home. As a high school student, it’s hard to realize that whatever university you choose will become your new home away from home. Look past twirling for a moment and think about if that school will make you happy despite being the feature twirler or not. I followed my mom’s advice and haven’t regretted my decision one bit. Ashley: Before our march to the stadium and before pregame, the drum major and us have a pre-performance ritual that we complete. We all hold our baton out in our right hand, count to three, pass the baton in the left hand quickly and simultaneously punch our right hand into the air while kicking our right foot. Once that sequence is complete, we then place our baton back in our right hand, and purposely drop our baton while saying “Last Drop!” Finally, Nicole and I lock our pinkies together and hug while Evan Bahm, our drum major prepares to start the band for each of the performances. Nicole: I couldn’t resist the idea of answering this question for Ashley. Let me start out by saying that Ashley and I live together along with 2 other band members, and so we have learned a lot of each other's random quirks. The one food Ashley could live on for the rest of her life is pasta! Every time Ashley steps into the kitchen to make lunch or dinner you know exactly what she’s making. I swear that girl is made up of penne noodles! Ashley: Soak in every minute possible! I can honestly remember arriving to campus for my first preseason like its yesterday. I came a day early and ran into my section leaders preparing for my arrival… Now, I’m looking back on all of the different opportunities that I have been given and wishing that I could relive them. Ashley: I looked up to Karrissa Wimberley. Karrissa twirled for Florida State University for her undergrad and for the University of Georgia for her Masters program. Although Karrissa had a phenomenal collegiate twirling career, she inspired me more from her coaching styles. I was fortunate to be able to take several lessons a year from both Karrissa and her mother at the Showstopper’s Studio. Both Karrissa and Cheryl encourage their students to be the best versions of themselves, to set goals, and help their students achieve them. Karrissa was one of the instructors who helped me create my audition routine, and she of course packed it with high energy tricks for entertainment, while still showcasing my technical abilities setting me up for success. Ashley: I am unfortunately graduating this spring (much to Nicole’s dismay). This is currently my last week of practice with the Spartan Marching Band. I will perform at my last Men’s basketball game this Friday, and my last football game in Spartan Stadium this Saturday. One of the Spartan Marching Band’s traditions is to have the seniors throw a rose into the Red Cedar River that cuts through campus on our last march out of the stadium. In addition to the rose, the twirlers also throw a baton into the river. This is symbolic of a chapter of our lives ending. Even though I have no plans of competing or performing again, I hope I can continue to have twirling be apart of my life through being a high school twirling coordinator. As for outside of twirling, I will graduate with a Chemical Engineering degree from the School of Engineering and the Honors College this May. I hope to have an offer of employment lined up within a week or two to become a quality engineer. Nicole: I am unbelievably happy (and relieved) to say that I have another year as an MSU student and feature twirler. I’m still not ready to lose my partner in crime, so I’m creating my argument to convince Ashley to change her major and stay for at least another year! (So far its not working...) In all seriousness though, I’m really excited for my senior year and getting to pass on the MSU traditions to a new twirler next year. Looking past my last year at MSU, I’m excited to move into the real world and pursue a career in nursing with the hopes of eventually continuing my education to become a nurse anesthetist. Now that I’ve reached my dream of being an MSU feature twirler, I’m working hard towards my dream of being a healthcare professional. Ashley: We will be holding auditions this spring for the fall of 2017! Please check the Spartan Marching Band website to ensure you don’t forget any materials (http://www.spartanband.net) but highlight tapes and twirling resumes are due by December 30th to our band Director John Madden. Callbacks for the live audition will be held on March 25th. At the live audition twirlers will be asked to perform a prepared 3-4 minute routine to music of choice, a down the field routine, an improvisation routine to music we will provide, a list of tricks, have an interview, and to run. Don’t miss out on your opportunity to twirl with this band and for an incredible Spartan Nation! *We put a lot of pictures. We really enjoyed going back over the last few years and finding them.